Restoring your smile to a healthy, stable state is essential when it comes to your everyday needs. From eating a balanced meal to feeling confident when you’re speaking in front of a room, the effects of broken or missing teeth reach far beyond their physical impact on your mouth. Fortunately, at 7 Pearls Dental, we’re able to craft expertly designed porcelain crowns and bridges to help fill in the damage or flaws caused by accidents and decay. Each of our custom restorations blends in with your overall smile for an aesthetic approach to restorative dentistry. Crowns offer conservative and comprehensive protection for teeth that cannot be filled. In situations where a larger area of the tooth has broken off, or a sizeable filling needs to be replaced, a crown protects the enamel by covering the tooth rather than being put inside of it. Otherwise, the tooth would continue to break apart after regular use. We also recommend placing crowns on teeth that have been treated with a root canal. 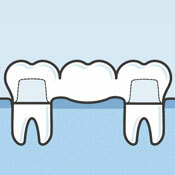 Bridges are sets of crowns joined together to fill in space where a tooth has been removed or fell out. 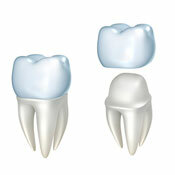 Each end of the bridge has a functional crown that rests on top of a supporting tooth or dental implant. The crowns suspended between them are fully functional, but they rest just above the gums with no pressure applied to the jaw in that space. Having a crown or bridge made usually requires two trips to our office. During your first appointment, we’ll shape the supporting or affected teeth that are to be restored. Next, we take a mould of the tooth/teeth and send it to our lab before placing a temporary restoration over the area to minimise any sensitivity. About 1-2 weeks later, you’ll return to have your new restoration tried in. Its exact shape, size and colour are all selected ahead of time. If everything fits properly, we will permanently bond it into place. Although porcelain doesn’t decay as tooth structure can, plaque and acids are able to slip under the edges of restorations, damaging the underlying tooth. To prevent this process from happening, you’ll need to carefully brush and floss around all crowns and bridges each day. Brush your new crown or bridge similar to how you would your other teeth, angling the bristles slightly towards the gums. When flossing, take care to wrap the floss snugly against the sides of each supporting tooth, moving the strand up and down just under your gum tissue. When done properly, flossing should never pull a crown or bridge off of your tooth. If you’re still hesitant, consider investing in a water flosser instead. You may also want to consider wearing a protective night guard while you sleep, to prevent any unwanted wear or chipping to your porcelain. Are you ready to smile with greater confidence? Enjoy healthier, fuller, whiter teeth. 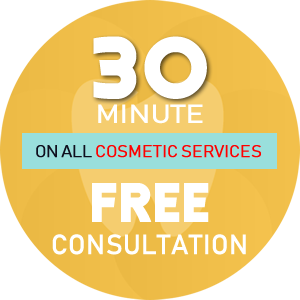 Request your new patient consultation today!